Estimates of pharmacokinetic parameters and evaluation of nutritional status rely on accurate measurement of not only body weight but also height. However, a number of common disabilities and disease processes make it difficult to accurately measure standing height in many patients. Therefore, various formulae based on bones that do not change length have been developed. These methods include knee height, forearm length and demi-span. Knee height is correlated with stature and, until recently, was the preferred method for estimating height in bedridden patients. Knee height is measured using a sliding broad-blade caliper. A device designed for this purpose is commercially available. The patient's height is then estimated using a standard formula. 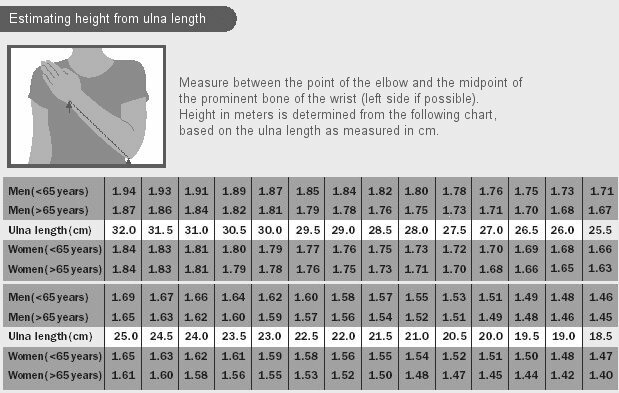 Clinically, the most useful measurement is the demi-span. This method is recommended by the Mini Nutritional Assessment, and, like forearm length, requires no specialized equipment. Demi-span is measured as the distance from the middle of the sternal notch to the tip of the middle finger in the coronal plane. Height is then calculated from a standard formula. All three methods provide reasonably accurate estimates of stature in normally proportioned adults. Demi-span may be easier to obtain in patients with lower limb dysfunction. For patients with severe contractures, forearm length may more practical. Malnutrition Advisory Group, British Association of Parenteral and Enteral Nutrition. October 2008. Malnutrition Universal Screening Tool. The Malnutrition Universal Screening Tool (MUST) is reproduced here with the kind permission of BAPEN.